The Singapore Art Museum (SAM) was founded in 1996 in Singapore. It is a public institution operating under Singapore's National Heritage Board. The Museum has over 7,000 works of art in its permanent collection. Besides collecting and exhibiting art from Singapore and the region, the Museum conducts art education, research, and exchange. The Museum has also partnered with well-known museums such as the Centre Pompidou, Stedelijk Museum, the Guggenheim Museum, the Shanghai Art Museum, Asia Society in New York, and Queensland Art Gallery. The Museum's building was initially St Joseph’s Institution (SJI), a Catholic boys’ school, which was established in 1855. The historical monument was fully renovated and includes "18 full climate-controlled galleries, an auditorium, a multi-purpose hall, a museum shop, courtyards, one café, and two restaurants." "Opened in January 1996, the mission of the Singapore Art Museum (SAM) is to preserve and present the art histories and contemporary art practices of Singapore and the Southeast Asian region. SAM has amassed one of the world's largest public collection of modern and contemporary Southeast Asian artworks." The Singapore Art Museum is located near the City Hall MRT stop and the Bras Basah MRT stop. It is easy to access via public transport and taxi. The Museum's art conservation laboratory is used for the research or maintenance of artworks in its permanent collection. According to the Museum's website: "SAM’s acquisitions policy devotes 80% of funds to Southeast Asian art, and the remaining 20% to the wider Asian region, such as China, India, Korea and Japan to provide a broader cultural context for the core collection." "An artwork is acquired for its artistic merits and innovation, as well as what it may reveal or reflect of wider developments in art and society. The artists represented in the SAM collection fall into three broad groups: the ‘pioneering’ contemporary artists or ones associated with avant-garde practices, mid-career artists, and emerging practitioners. Through its acquisition policy and continued funding support from the government, individuals and corporate donors, SAM is able to include iconic works of art in its collection, encourage artists to create important new works through artist commissions and showcase the best in contemporary art from the region." SAM at 8Q is the Singapore Art Museum's branch museum which specializes in contemporary art. It is located at 8 Queen Street near Bras Basah Road. 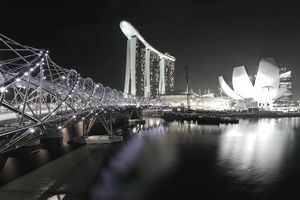 SAM also organizes the Singapore Biennale which began in 2006 and brings international artists to exhibit in a thematic curated art exhibition. The Museum requires a huge and diverse staff in order to operate. Professional job opportunities periodically become available in the various departments such as the Curatorial, Conservation, Education and Research Departments and entry-level jobs in the Museum's daily operations such as in administrative, finance, information, sales, security, and technology. Job listings are posted via the National Heritage Board. Job listings change regularly, so be sure to check the Museum listings periodically. Be sure to update your resume before applying for a job in an art museum. To apply for a job at the Singapore Art Museum, you will need to check out the job listings posted on the National Heritage Board. Besides employment opportunities, the NHB posts volunteer and internship programs which become available.